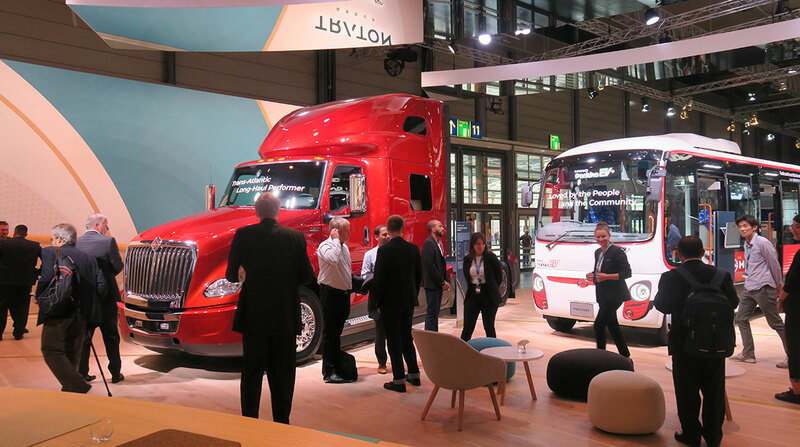 HANOVER, Germany — The partnership Navistar International has entered with Traton Group is opening up opportunities for economies of scale with procurement and technology development, Navistar executives said here during the IAA Commercial Vehicles show. Navistar Chief Financial Officer Walter Borst said Navistar and Traton are on track to realize the $500 million in cumulative synergies they said they would see over a five-year period. Borst also said he views Traton’s move into a joint venture with Hino as evidence that its deal with Navistar is working out. Those opportunities extend to technology development, an area all three companies can explore together, Clarke said. “The ability for us to not just license technology from our alliance partners, or vice versa, but really the opportunity for us to participate in new technology development — that is different,” Clarke said. “That difference lies in working together to build something from the ground up as opposed to finding a new customer for what is already there,” he added. “In my career, we’ve had things that we called alliance, and we really struggled — most of them don’t exist anymore — because they tend to be unstable; you tend to find yourself selling something to each other, as opposed to creating something with each other. “That work is going on now,” Clarke said, but he declined to share specifics. A vital element is making the right choices for the company, noted Friedrich Baumann, Navistar’s senior vice president for joint strategy and planning. “When you look at the breadth of technology to which we have access now, we are basically working on getting as much of that — obviously, what makes sense in our marketplace — incorporated into our future product line as quickly as possible,” he said.